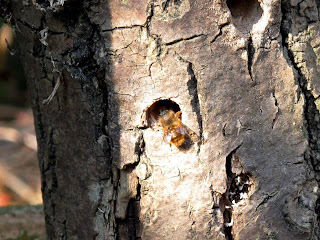 Yesterday, we decided to move our bee post from the very unsuccessful position it has been for a couple of years. 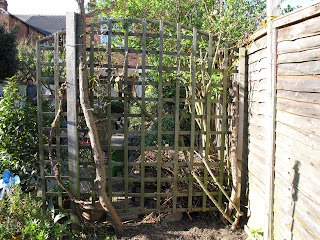 It was too shady and not very visible to us, so we decided on a more exposed, south facing location in the garden. 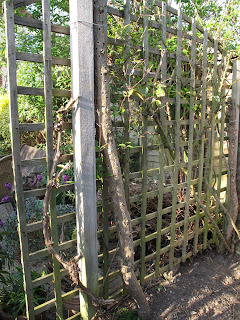 We made a new post, also on an ash branch, and drilled more holes in the old one just to make it a bit more attractive and secured it to the end of our trellis (it will be covered by a vine, clematis and rose later in the season). This is what the end product looked like. 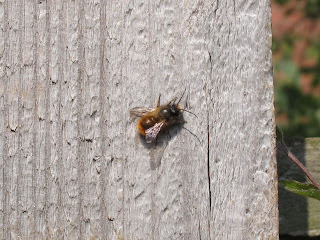 Red mason bees (Osmia rufa) males have been patrolling and feeding in the garden since the beginning of April. They like to sit on the conservatory wooden frame, garden posts and leaves and then follow a route around the garden, stopping nervously here and there. 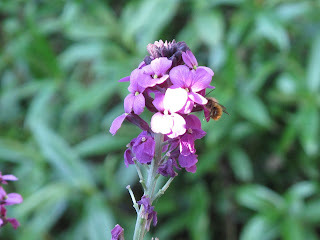 I've seen them feeding on Grape Hyacinth and Erysimum 'Bowles Mauve'. 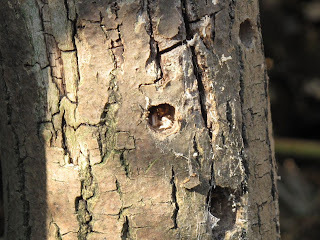 Today, in the afternoon, barely 24 hours after the post were placed in their new location!, we've seen a male inspecting the holes (looking like it was counting them over and over) and then a female - the first I've seen this year - actually getting into a hole and kicking out some pieces of wood. When she emerged, she was briefly chased by the male. At some point we could see two males. 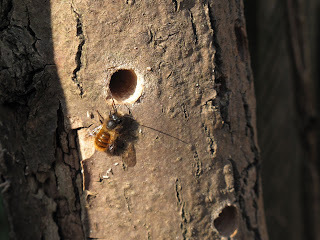 The bee posts will hopefully attract other bee species and their parasites, so I look forward to the next season of post watching. It was just chance we decided to move the post and then it seems to be a preferred location. Watch this spot as there is a new post -not wooden this time - coming with an update!